The unique. The bizzare. Believe it or not, it's all at Ripley's. Discover St. Augustine your way! Like Ponce de Leon, everyone wants their chance at eternal youth. Tour the architectural work of art by the renowned Franklin Smith. Start planning your Florida East Coast vacation with Reserve St. Augustine. You’ll find fun, money-saving St. Augustine, FL vacation packages, attraction tickets , and tons of great lodging options including hotels in historic downtown. If you have any questions about booking your St. Augustine, Florida vacation you can always call us. We’re here to help! Tripster St. Augustine coming soon! 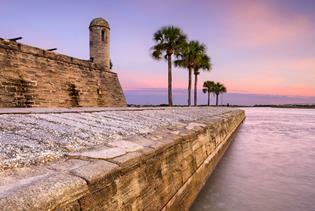 St. Augustine, Florida, known as the “Nation’s Oldest City”, is a popular vacation destination for travelers year-round. Its rich history and historic landmarks set it apart from other coastal Florida towns. St. Augustine is the longest continually inhabited European-founded city in the United States. Explore over four centuries of history as you walk the streets of St. Augustine. St. Augustine may have plenty of historical landmarks to keep you occupied, but its beaches are another reason visitors flock to the town. From Vilano Beach in the north to Crescent Beach in the south, St. Augustine offers miles of coastline with plenty of beach activities and options. Visit Anastasia State Park to see a protected bird sanctuary, hiking trails, and five miles of beaches. If you want to stick close to restaurants and shopping, give St. Augustine Beach a go. While vacationing in St. Augustine, enjoy some of the many attractions in town. For an insider’s look at some of St. Augustine’s best restaurants and pubs, take a food tour or pub crawl. The kids will enjoy many of the Ripley’s attractions and the Pirate & Treasure Museum. And no trip to St. Augustine is complete without a visit to Ponce de Leon’s Fountain of Youth Archaeological Park.